Our mission is a simple one: to efficiently raise money to purchase bikes and helmets for worthy endeavors. We do not have access to credit card information. We do not collect and store information on donors except to verify donations to the IRS. We take all normal business measures to safeguard donor information. We do not share donor information with any other organization. We do post donors names on this website, but a donor can ask for anonymity or to have their name removed. 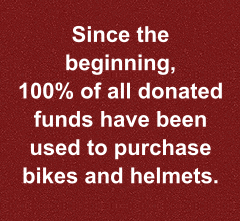 100% of all donations purchase bikes and helmets.